Today’s review is of Fair Lash Advanced Eyelash & Brow Enhancing Serum by Le Fair. It is formulated, says Le Fair, to give you longer, thicker eyelashes and brows. The manufacturer says it has used top-tier, non-irritating ingredients that will show results in mere weeks. With so many serums on the market promising great results, is it possible to tell which products will work? Yes, fortunately, research and medical science have established which products are not-negotiables in the quest for flattering lashes. We will use these as the benchmark for analyzing this product. 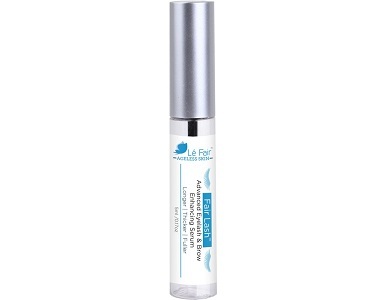 What’s In Le Fair Fair Lash Advanced Eyelash & Brow Enhancing Serum? Vitamin E is clinically proven as a major antioxidant. It is so vital that it is hard to conceive of any moisturizer or serum that should be without it. Not only does it fight environmental and other pollutants, but it also boosts collagen production. Collagen firms and plums the skin, and helps restore elasticity. The best way to achieve this is with Vitamin C, which, unfortunately, hasn’t been included. However, amino acids have been included and they are the building blocks of collagen as a protein. Ubiquinone or COQ10 helps slow aging on all fronts and is used to fight many degenerative diseases. Here, it helps your skin cells stay young. As an amino acid, arginine HCL as great potential to restore skin health and fight the signs of aging as well. Notably, ingredients required to strengthen and condition the lashes long term, though, are missing. The most important missing ingredients are vitamin B5, resveratrol, pea sprouts, and the hydrating, rejuvenating marula oil. How Do You Use Le Fair Fair Lash Advanced Eyelash & Brow Enhancing Serum? Apply a thin line along your upper lash line once a day at nighttime. Apply the serum nightly onto the roots of your clean eyebrows. La Fair says you should see results in a few weeks. On the product website, you’ll pay $ 24.90 for the wand, which is indicated as being $99.99 at normal price. If you enter a certain promotional code, you’ll get 5% off, but it isn’t clear how you obtain this promo code. Standard shipping in the US is free. There are no discounts. There is a cath if you use a promo code – there are no returns on such products. What is the length of time you have to return products? If it is not 365 days, their claim cannot be true. Some confident manufacturers are able to offer 60-day and upward time periods, all the way to 365 days. Is the return shipping also paid by the manufacturer? Some manufacturers pay return shipping as an extra. Can unopened and partially used products be returned? Some ‘satisfaction’ guarantees only apply to incorrect orders received or damaged goods. This lack of transparency never serves a customer well, in our opinion. It also wastes your time because you first have to find out the policy details instead of knowing what they are. Le Fair places great focus on good customer service. It is transparent about which ingredients it uses, so if you have an allergen or sensitive skin, you’ll know if you have to avoid it. As it turns out, there don’t appear to be any obvious allergens. This serum includes important amino acids and Vitamin E, two vital ingredients. Although the company is transparent about its ingredients, more detail on why each of them was added to the final mix would have been helpful. It is also of some concern that while the manufacturer promises it uses safe ingredients that do not irritate skin, it does not overtly guarantee that animal testing has not been done. No GMP certification is provided either. Additionally, nor does the company offer proof of GMP certification. This casts the integrity of the production process into doubt because we cannot be sure that zero ingredient contamination or alteration has taken place. There are also no patented ingredients, further raising efficacy concerns. The most hardworking, effective lash and eyebrow cosmetic lines include at least five patented ingredients, all clinically proven to deliver defined results, with five patented ingredients being the required benchmark. The product is also lacking vital non-patented ingredients such as the uniquely beneficial marula oil and resveratrol. You would be more assured of results if you used a product with these multi-property ingredients.